We are an interfaith organization committed to active nonviolence as a means of radical social change through education and coalition building. We engage social justice issues through nonviolent action locally, nationally and globally. The chapter’s current programs include education and advocacy through our monthly newspaper, FORsooth, the monthly Third Thursday Lunch speakers series, the weekly vigil to end the Israeli occupation of Palestine (Friday 12 noon at the corner of 6th and Broadway), and FOR’s Aim Higher Committee, which works to stem the influence of the military in the lives of young people and, through the Peace Essay Contest, encourage students to learn and write about nonviolent conflict resolution. We are especially excited about our two newest projects. The biggest news is that FOR has won FCC approval to establish a community low-power FM radio station FORward Radio. In addition, Aim Higher is expanding its advocacy work in the Jefferson County Public Schools, challenging JCPS to shift attention and resources toward reducing racial and other disparities in student achievement and discipline, thus better preparing all students for success in the civilian world. 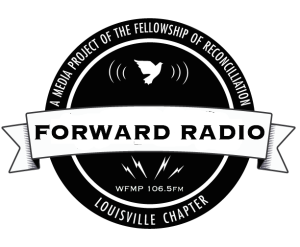 FORsooth is the acclaimed Louisville Fellowship of Reconciliation’s (FOR) monthly newspaper. Starting over twenty years ago as a simple schedule of local events and activities, the paper has grown to its present 8 page format. It still features a schedule of events, activities and local contacts for Louisville’s peace, justice and solidarity communities. In its pages you will find articles written by mostly local writers on issues of peace, racial justice, immigrants, GLBTQ rights, the environment, women, labor, politics and much more. number of black youth locked up in Louisville’s juvenile system. including The Tennessean and the Omaha World-Herald. Reporting, a nonprofit investigative newsroom housed at 89.3 WFPL. PLEASE NOTE: If you make a reservation and then need to cancel, please cancel by the Monday reservation deadline. Failing to do so means that Hotel Louisville prepares more food than we need and we are charged for the meal that is not canceled. We thank you and look forward to seeing you!